Amateur-satellites with 38400 Baud FSK-modulation (G3RUH) are in the orbit since 1999. First packet-radio digipeaters with 76 kBaud are operative in Germany. With the IFD, you can expand the capabilities of most amateur radio receivers to high speed data reception as 38400, 76800 and up to 153600 Baud. Principle of function: The IF signal of your amateur radio receiver is tapped directly behind the rf frontend (1st mixer) and connected to the input of the IFD module. There, the signal is converted to a second IF frequency of 10,7 MHz by a mixer circuit and a fixed frequency crystal oscillator. 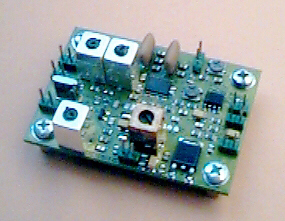 The IFD assembly is available for most common IF frequencies e.g. 71 MHz, 45 MHz, 21,4 MHz, 13,45 MHz or 47,43 MHz (FT736) or 10,7 MHz. The bandwidth of the IFD amplifier is standard 110 kHz for 76 kBit/s maximum data rate. Wider filters (300 kHz / 156 kBaud) or narrower types (80 kHz / 38 kBaud) are available upon request. If a external oscillator (VFO) is connected, the IFD module may be used as a simple wideband receiver with FM demodulator, e.g. as receiver for UHF/SHF/EHF converters. Description, installation instruction and special parts (coax cable, transformers if required) come with the IFD. The assembly is tested and adjusted. Until now, you can order the IFD for the transceiver types FT736, FT748, IC820/821, IC471, IC475, TS790, TM-V7E and similar. Data: Supply 8 to 18 Volt DC, filter bandwidth: 110 kHz (standard), audio/data bandwidth: over 25 kHz, input frequency: 1 to 150 MHz, sensitivity: ca. 1 mV / -110 dBm @ 50 Ohm, buffered logarithmic RSSI-output 0...5 Volt for -110 to -40 dBm signal strength measuring, low impedance data/AF-output 0.12 Volt at 38 kBaud data rate (low-pass-filtered). When ordering, please mention the radio type for which you intend to use the IFD with. Kenwood TS2000 41.895 MHz 450 Ohm not a big problem. SMD parts to solder. 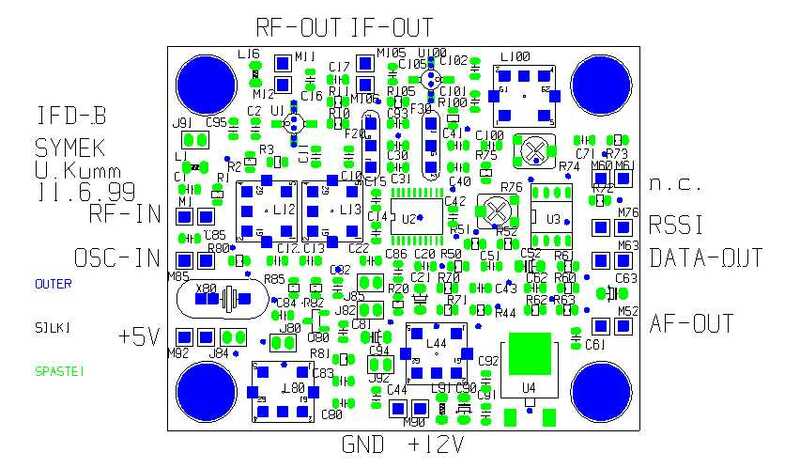 Ordering instructions: F-IFD for transceiver-type xxxx, desired baudrate (bandwidth) xxxx Baud.